Hi everyone, welcome back! After your positive response to my “It’s In The Bag” post, I thought I would do a little peek inside of my gym bag. I used my NCAA duffel for years after I stopped playing college sports, and a new one had been on my radar for almost as long. There are plenty of bags that are loaded up with bells and whistles, but this simple Converse bag felt right for me. I love the retro feel that all Converse products have, so it’s nice to be able to carry it with me every day! Hair Elastics. I have spare hair elastics everywhere, so my gym bag is no exception. Burt’s Bees Lip Balm. Another item I have stashed all over the place, I hate the feeling of dry lips while I’m working out. Small Nivea Lotion. In the winter, I constantly have dry skin and it’s terrible to work out with. I always pick up a body lotion in the travel section at Target so I have something easy to throw in my bag that doesn’t take up too much space. Evian Facial Spray. Another handy product for those dry skin days, I love spraying this on my face before and after a workout! Clinique Wipes. Depending on my schedule for the day, I don’t always shower at the gym. If I’m going home, I always try to wipe my face off with one of these wipes, so the sweet doesn’t clog my pores too much on the ride. Bose SoundsSport Wireless Earphones. Once I got my Apple Watch, I knew I was going to want a pair of wireless headphones for the gym. Not having a wire is such a small little luxury that makes the gym a little bit more pleasant. Plus, the sound quality on these is awesome. Cleanser and Moisturizer. When I do shower at the gym, it’s important to me that I have quality face products with me. I can live with the provided shampoo and conditioner, but I always have to have some skincare with me. Over the holidays, I always pick up gift sets of products I’m interested in trying, since they come in such convenient sizes. Currently I’m using this one by OleHenriksen. I also got my mom this one from Skin Laundry, and B a smaller size of his favorite skin products (more about that here). Sneakers. During the winter I try to avoid walking through the snow and slush in my gym shoes. Luckily my bag has a designated shoe pouch for them! Nike running shoes are my favorite gym shoes. Snacks. Working out in the morning, I generally don’t eat a full breakfast before I head to the gym. Usually, it’s a KIND bar in the car on the way there. I also like to keep small bags of almonds in my bag so I have a snack immediately after my workout as well (I got these ones at Starbucks, but you can find small snack size packs of nuts anywhere from Target to TJMaxx). Water Bottle. I am oddly particular about my gym bottles. I prefer it to have a squeeze top, and something that is easy to open and close without touching the mouth piece, and be able to take the occasional drop. CamelBak is a safe bet for a brand for me. Lock. I recognize that this is extremely glamorous, but it’s the most necessary. 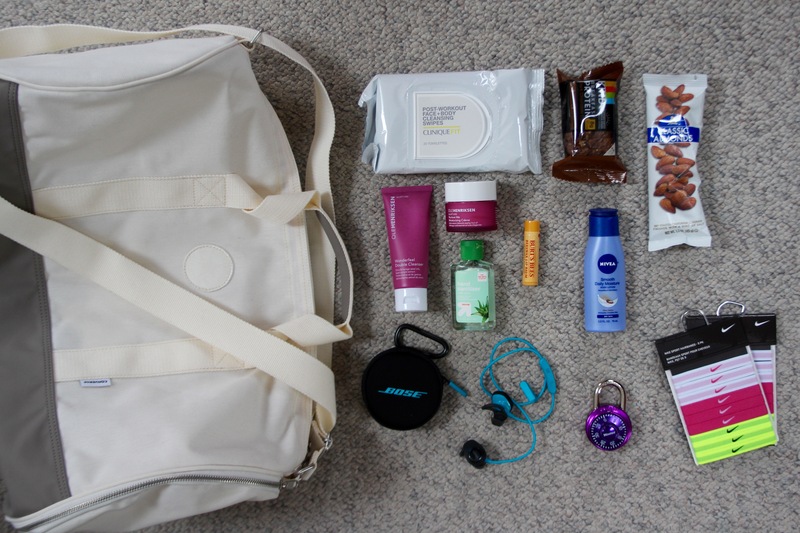 What are your gym bag essentials? Let me know in the comment section!